Another road course "race" before the 500's like three choices of kale in a store – superfluous and wrong. Anticipate another entertaining season opener on St. Pete’s street course oddly enough, even without flying aero kit pieces or Juan “street cleaner” Montoya in the field. Less surprisingly, thrilling contests again will ensue at Texas Motor Speedway and Gateway Motorsports Park, both oval races held under the lights. Now if only the egg heads at 16th & Georgetown would heed IRR’s advice and return Iowa’s race to a nocturnal knife fight and bring back excellent tracks like Kentucky, Chicagoland, Michigan and Fontana we’d have more awesome oval affairs to look forward to. The series’ pair of new Swedish drivers – Schmidt’s Marcus Ericsson and Ganassi’s Felix Rosenqvist – will spend the 2019 campaign stuck in neutral. Suffice it to say their transition won’t be pretty. Racing at Sonoma through the years has often been painful to watch, and the season finale was no different. Admittedly, there were a few moments of pleasure along with hours of punishment. 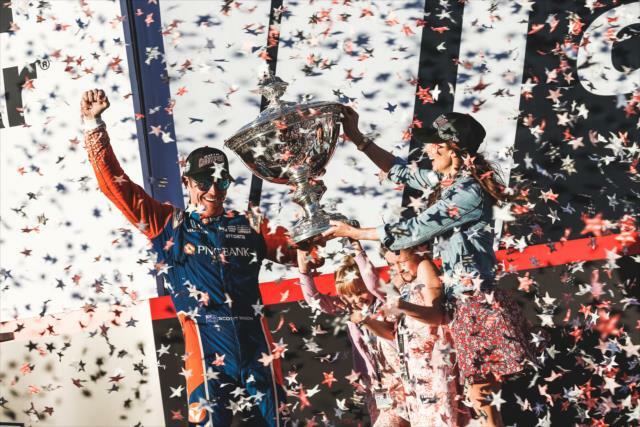 Scott Dixon clinched his fifth championship Sunday in dominant fashion, totally overshadowing Ryan Hunter-Reay who abused the competition from pole in IndyCar’s final race at the dungeon like track. In a curious move by the series’ sole broadcast partner, NBCSN viewers missed an eventful start due to preemption by a NASCAR crash and delay at Vegas. Of course it proved to be one of few interesting segments of the day, and for fans it really hurt. As Hunter-Reay led the field to the green his teammate Alexander Rossi suffered a brain fade typical of his youth and inexperience. Entering turn 1 the championship contender inexplicably ran into the back of teammate Marco Andretti, damaging his front wing and right front tire and all but eliminating his title hopes. Rossi would battle back and almost make it interesting by the end, but couldn’t surpass Dixon’s maturity and experience. Sonoma Season Finale Predictions & Prognostications: A Frenchman, A Kiwi & A Mexican Walk Into A Wine Bar . . .
With season’s end in sight, so too are the soon to be crowned champ, race winner, first to exit and – thanks to IRR’s amazing powers of prognostication – various other hilarity inducing outcomes. The special prediction not only for the season finale but also for the last IndyCar race at Sonoma – at least for a while, considering this series’ schizophrenic schedule one never says never – is that the place won’t be missed. At all. Rather, the so-called racing there‘ll be about as sorely missed as a severe wine hangover. Our pick for pole is Will “not so super” Power, again. It’ll be his fifth of the season and fifty fifth pole of his career. He trails only Mario Andretti’s mark of 67 poles on the all-time list and could well break it in the future – especially if his competition continues their joke like qualifying efforts. Power topping Mario, A.J., or any of the other greats in IndyCar annals strikes us as being in incredibly bad taste. First out of the finale will be one of Harding Racing’s multiple rookie entries. Our pick is Indy Lights champ Patricio O’Ward in what will be his first career start for the upstart outfit. The 19 year old Mexican impressed in the junior series, winning over half the races and poles he contested and finishing every one. With struggling Harding however, expect that run to come to a halt Sunday – quicker than a south of the border street burrito races through whomever’s dense enough to eat it. Rahal Letterman Lanigan Racing had quite the day at the Portland Grand Prix, with one driver in victory lane and the other ripping the racing, the stewards and the series. 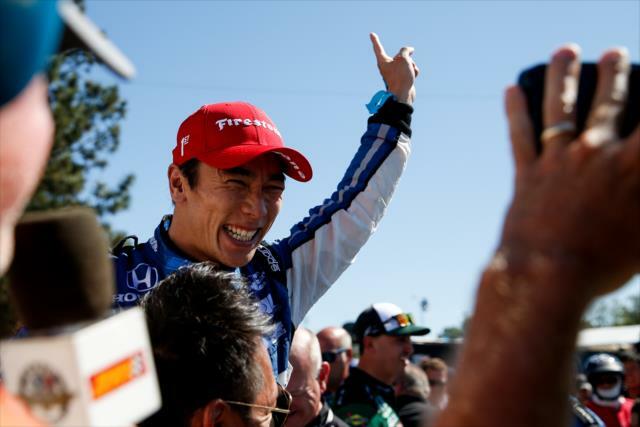 Indy 500 winner Takuma Sato scored another victory, while his teammate Ragin’ Graham Rahal was along with several others caught up in another frightening first lap pileup that for once was no fault of his own. However, his scathing criticisms of blatant incompetence in race control had us grinning from ear to ear. After qualifications but prior to the race, two Andretti Autosport teammates who factored largely in the outcome poignantly diverged in their assessment of the place. And after eleven years away, why not? Ryan Hunter-Reay praised the braking zones as portending engaging racing, while his teammate Alexander Rossi said flatly, “we all know it’s hard to pass here.” In the long run, Rossi was the more correct – though less lucky – on the day. Once the green flag flew, Rossi sped around Josef Newgarden for second, with RHR gaining too, until trouble struck. In the back Simon Pagenaud initially encountered problems going off track, followed by fellow Frenchman Sebastien Bourdais. Then the latest frightening first lap crash occurred due to contact between rookie phenom Zach Veach and James Hinchcliffe in turn 3. Hinch spun, causing a trailing Marco Andretti to spin and roll backwards over Hinch’s car, flipping upside down in the process. After Pocono, it was the last thing anyone wanted to see, although Portland’s configuration – specifically the chicane – invites it. Remarkably, and once he was turned right side up, Marco jumped out of the car unscathed, though covered in dirt. He spoke of being “really lucky,” and of his head being “on the ground,” thanks to Rahal hitting him from behind. More records are likely to be broken as IndyCar screeches into Alabama this weekend, the series’ third consecutive race since inexplicably skipping an entire month after the St. Pete opener. Sorry to sound like a broken record, but Team Penske’s success at Barber is nearly as unblemished as a mint condition Beatles vinyl still in the original packaging. IRR renews its call for more rich, riveting oval track sweetness, as road races truly are the skim milk of IndyCar. Longtime readers are no doubt accustomed to our overt oval track preferences. It’s significant to note however that recent seasons more than bear this out. Take last year, for example. Indy, Pocono, Texas and even East St. Louis (of all places) were easily the most entertaining races of the season. By contrast, St. Pete, Toronto and Watkins Glen were terrible. Happily the latter’s no longer with us – one down, two to go. It’s really no surprise as high speed, circuitous venues routinely outshine their plodding, winding yet more numerous counterparts. That is unless your idea of compelling competition is Sonoma last September – talk about sour! For the first time a fervent though flawed follower inspires IRR to provide even more real world racing answers. The series’ recently concluded campaign proved predictable – at least to us – and lacked both a sense of rhythm and any real rivalries. While having its moments, overall 2017 missed out on the excitement and drama of previous years. This season’s highlights included breathtaking oval racing at Pocono and – to a lesser extent, thank you Tony Kanaan – Texas. Even the racing at Gateway was much improved over the last time they visited a decade ago and an additional oval on the schedule – no matter how inadequate its layout – is welcome change. Lowlights involved beyond tedious racing at the usual suspects like Mid-Ohio, Watkins Glen and the season finale at Sonoma. Even St. Pete was a stinker this year and as usual the Indy Grand Prix was nearly unwatchable. Iowa‘s daytime race – as opposed to the superior night races of years past – earned the biggest flop award, with Phoenix a close second in the balloting. Iowa Speedway already announced a Sunday date in early July, meaning it’ll be another day race next year. Easily the most absurd moment of the year was f-ing F1 invader Fernando Alonso being gifted the Indy 500 Rookie of the Year award over Ed Jones, or “The Great Hardware Robbery,” as we termed it. This was closely followed by Alo’s team owner Michael Andretti’s brief flirtation with Chevy after winning the last two 500s with Honda and Sam Schmidt beginning to mimic Andretti’s dumb Indy 500 decisions. IndyCar Sonoma Season Finale Predictions and Prognostications: Adios, Aero Kits! IRR sets forth its final predictions of the 2017 season – including a surprise champion – while bidding adieu to a crime against racing aesthetics. Our special prediction for the GoPro Grand Prix is while Sonoma may not feature much passing on its twisted, narrow confines, at least it’s the last time we’ll ever have to watch those hideously fugly, dangerous aero kits in action. Their departure alone will make this nearly unwatchable finale held in a dustbowl almost palatable, raising our spirits markedly in the process. That, and the wine. Incidentally, since the cars become obsolete Sunday night – it’s about time – we’d love to see a non-points demolition derby held immediately following the podium celebrations. Charlie “pinball” Kimball, J.R. “hair today, gone next year” Hildebrand and Taku Sato would battle for an Andretti Winery gift certificate and Conor Daly’s domestic duties for a day. Which leads us to . . .
Saturday’s fight for pole position will take on special significance at the infamously tedious track, with the championship contenders – Team Penske and Ganassi’s Scott Dixon – vying for the extra point and tremendous advantage starting up front at Sonoma brings. Four of the last five Grands Prix have been won by drivers starting in the top 3, including fickle Frenchman Simon Pagenaud from pole last year and Dixon’s win in 2014 (his win in 2015 came from 9th). Not prone to flowery descriptions, a sometimes acidic tongued IRR stopped in Sonoma wine country to smell the season finale roses – or rosé, as it were. Instead we found a big, fat turd bouquet. Northern California wines may be fine, but unfortunately for fans of fast the racing there’s regularly near the bottom of IndyCar’s barrel. “In vino, veritas” as the Romans said, but even from a clear-eyed, sober view of things the racing at Sonoma honestly stinks. Like other regrettable road courses on the schedule – Watkins Glen, Barber, Mid-Ohio – the twisted track’s an affront to the olfactory senses. Bouquet, indeed! Sonoma’s simply not suited to IndyCars and fails to provide anything approaching intoxicating action. In fact, the lack of passing, speeds and thrills is all rather dry and pedestrian. The series’ choice of venue for the season finale tends to leave an unpleasant, vinegary aftertaste. Like the local produce, reigning series champion Simon Pagenaud comes across as fruity, often with a hint of bitterness. This was especially the case following his spicy encounter with Penske teammate Josef Newgarden at Gateway. Let it suffice to say Pags was less than vintage during the podium celebration.